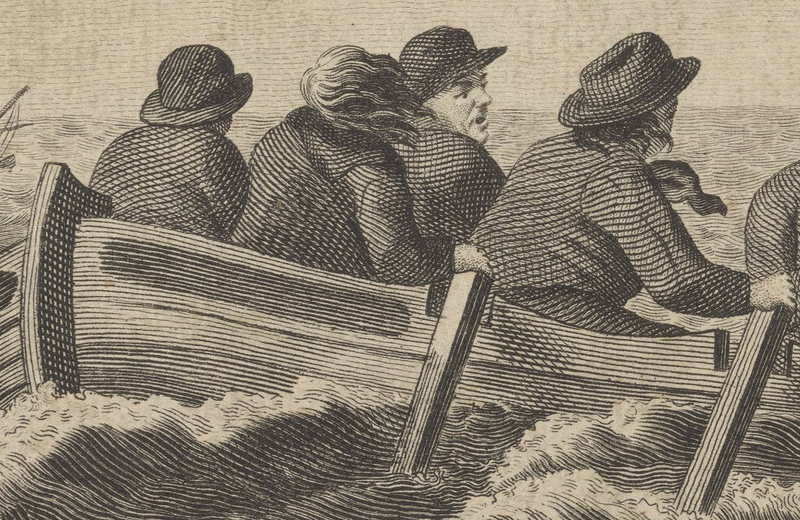 "Robinson Crusoe and the Crew escaping from the Wreck in the long Boat," printed by Carrington Bowles, 1783, Yale Center for British Art. Daniel Defoe's Robinson Crusoe is the fictional tale of a seaman marooned on a South American island, where he struggles to survive his isolation until an eventual rescue brings him back to civilization. It's a novel with incredible staying power, so much so that Hollywood occasionally feels the need to drag it from the shelf and give it a sound beating every few years. Just as modern producers ride the coattails of Defoe's 1719 novel, so too did eighteenth century printers. In this case, Bowles gives us the moment when Crusoe is cast adrift on his first voyage. A storm has wrecked the vessel, and the crew have piled into the boat to make their escape. Not taking the hint from fate, Crusoe would later be enslaved by pirates, rescued, engages in a slaving voyage himself, and is finally marooned. 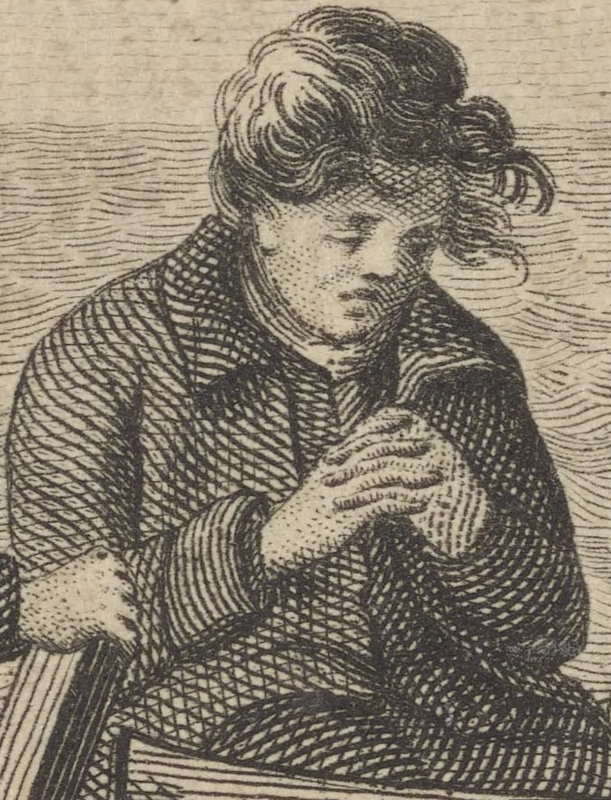 This image, from "Twelve Prints representing the Surprising Event in the Life and Adventures of Robinson Crusoe," depicts his first harrowing escape. Clustered in the bow are the oarsmen. Three of them wear round hats with narrow brims and rounded crowns, while a third is hatless. All of them wear dark jackets, and at least two wear dark neckcloth. The hatless tar's neckcloth is draped over the back of his jacket, in a fashion we've seen before. At the stern, the coxswain directs his sailors over the heads of distressed passengers. 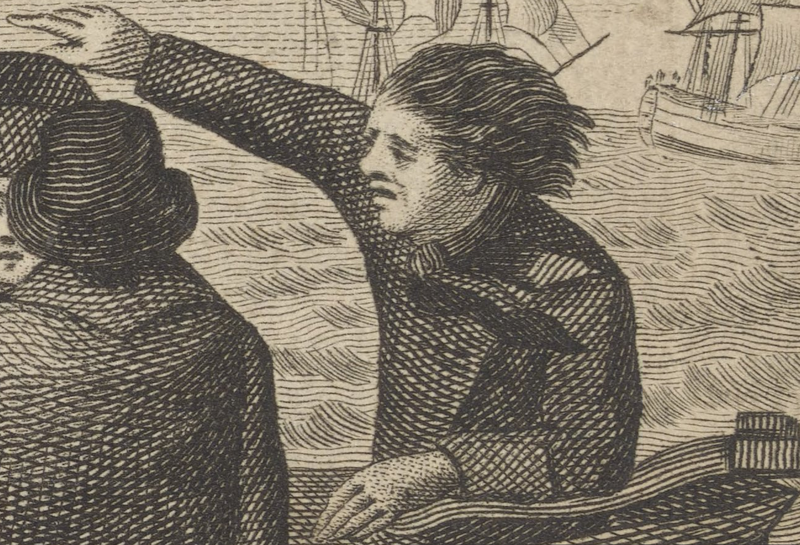 The cox is hatless, and his short hair is being pushed back by the wind, as is his dark neckcloth. His jacket (or possibly coat) is buttoned across his chest. The cuffs of his jacket are folded back, but with a slit in them not unlike a mariners' cuff. Defoe captures this entire scene in a few short paragraphs. This leaves a lot of speculation for the printers as to the arrangement of the boats and who would be where. For this reason, and given the way the coat is buttoned over, I think the cox is the ship's master. Typical landsman! Turned back cuffs, what appears to be a long coat, and a white cravat. Not a hint of the sailor's slops on him!